Emily Gastineau unpacks the ways BodyCartography Project is using real dance skills of sensing, paying attention, and examining perspective to redefine the textures and parameters of arts engagement. To put closer (part 2) into language introduces a particular conundrum. The primary concepts the piece explores—engagement, focus, access, sensation, participation—are also current buzzwords in the arts, ubiquitous goals we hear so often they’ve almost lost their meaning. I don’t believe that BodyCartography Project is following a trend—to the contrary, they’ve been investigating how bodies engage with each other for many years. They just happen to be working at a moment when the values that became prevalent in dance decades ago have now been absorbed into mainstream culture and contemporary capitalism. (Have you scanned the business section at Barnes and Noble lately? It’s full of lessons on creativity, collaboration, and innovation.) When translated into business contexts—and plenty of artistic contexts, too—the work of engagement is too often surface-level, a box to check, quantifiable rather than understood with depth and qualitative complexity. All those who “engage” with the term “engagement”, take note: with closer, BodyCartography Project has effectively created a primer for fulfilling its possibilities. I enter the Red Eye Theater to see that it’s been converted into a black box studio, with a marley floor, no designated front, and just a few chairs around the edges of the space. Viewers are settling in these chairs or on the floor, some observing or moving with the performers. I’m still situating myself when Olive Bieringa comes close to me and says, “Can I dance for you?” I say yes, and she rolls on her back on the marley, almost into my lap. She places her hands in front of my face, shifting them to frame body parts, both hers and mine. My focus zooms into the space between her fingers, losing track of the activity in the rest of the room. Next, she backs away from me, far across the space, and I experience something like tunnel vision as my focus adapts to the distance. I choose to keep my eyes on Olive, because she said this dance is for me, but I can see other movement at the edges of that frame. She ducks behind the black curtain on the side of the room. I can no longer see her, but I can hear her footfalls, and I watch intently for the curtain to ruffle, tapping into kinesthetic awareness to discern her location. Olive emerges from the curtain, comes back to me and whispers, “Thank you.” It serves as an ideal prologue for the performance: She’s giving me specific tools for how to view the rest of the piece. This dance instructs: Focus close or take a wide view. Use all your senses, not just vision and hearing. Watch with your whole body. Sense the information that you can confirm, but also stay open to contingent information. The lights shift, the room settles, and Justin Jones takes a solo. He hovers with long limbs extended; he throws himself across the space, weaving in and out of the viewers and other performers on the edges of the room. Then the performers take turns to describe their impressions, the qualities or allusions they saw in his movement, and their own experience of watching. As a dancer and improviser, I immediately recognize this discussion as the usual follow-up to most movement activities in class or rehearsal. Again, I feel like I am being instructed on the nuts and bolts of movement practice—which must be a refresher for some and a new skill for others. It’s simple and accessible, but it’s not easy. Seated between other audience members and dressed in loose, casual gray and blue clothing, this presentation of the performers asks me to relate to them in their roles as such. But one need not have a specialist’s knowledge to do so; we can all develop a practice of viewing. Justin’s solo gives way to group dancing, involving the five core cast members in pairs and trios. I detect some brief unison movement and set spatial patterns that arise out of improvisation. Even in the most “set” choreography in this section, however, I get the sense that the dancers are interpreting the same intentions or instructions, rather than executing predetermined, synchronized movements. In this dance, qualities and textures of movement are privileged over repeatable shapes. Most important are the verbs: shaking, expanding, sloshing, placing, reaching, folding, swinging, rolling, scuttling, upsetting, lifting, pushing, falling, sliding, circling, throwing, jerking, flipping, twisting, leaning, stepping, churning, flouncing, swiping, fluttering, waiting, releasing, ruffling, floating. It’s a continuous progression of new action, individually executed. That is, it’s Anna Shogren’s particular vibrating, not a unified idea of vibration. Whether the performers are moving from bones, organs, skin, or nerves, they roll through each action and slide into the next. This is not just a display of somatic intelligence—rather, their dance physicalizes the agility, responsiveness, and proliferation of new forms that is necessary for survival in a fast-paced, competitive society. I’ve been aware of my senses since I entered the performance space: the feel of the dance studio invites me to take off my shoes and stretch my legs out on the floor. Expanding the palette of sensory options, the next section of the dance occurs in the dark. I now rely on sound, touch, and proprioception in the absence of vision. I hear the skin of the performers’ legs sliding and slapping on the floor and feel the air shift as they move near me in a herd. One performer brushes against my foot, but then doesn’t shy away, providing sensation and contact I am already primed to absorb. The darkness is punctuated by a single purple light that locates performer Dolo McComb, who spirals beneath the light as if it were a thick and tactile substance. Later, when Otto Ramstad hands me a cold orange La Croix as the audience starts to disperse, I am pleased and unsurprised: of course, I need to taste something before this piece ends. Several of the performers in this work play a dual role, dancing with the ensemble as well as modeling participatory audience behavior. 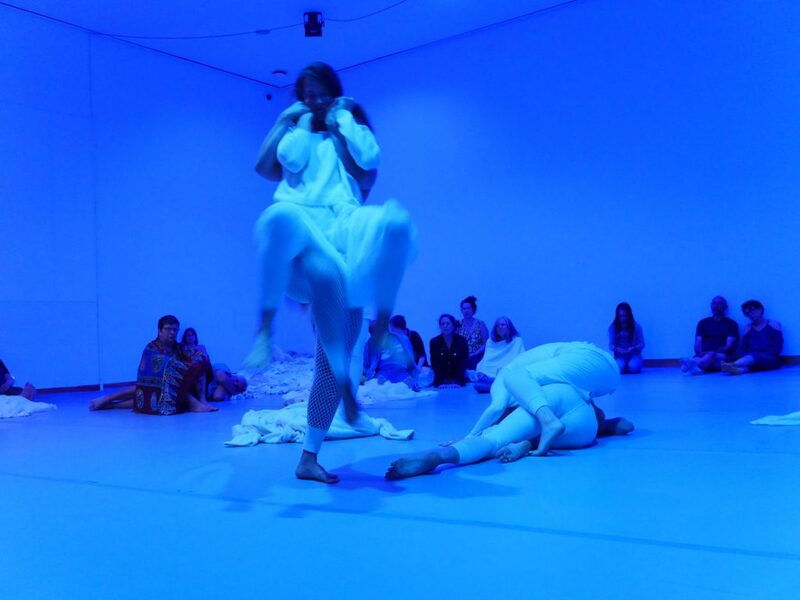 At a few key moments, these performers invite the audience to move to a different part of the room and literally change their perspective on the dance. I appreciate the non-invasive direction, even near the end when they compress all the audience members into the middle of the room. All the performers form a circle around the audience and perform rhythmic stepping and turning in unison, almost a pedestrian folk dance. I think we in the audience are supposed to feel embraced and included, though I feel slightly more exposed. I notice a few audience members now begin to dance on their own, no longer merely watching but taking up space with their own experience. Personally, I want to experience viewing in its fullest capacity; I feel it’s not my turn to be a co-creator—so, I make sure that I am sensing with my whole body, then stand and wait for further instruction. Soon, a performer takes my hand, and I agree to join the action. It’s fitting to end the work this way with social dance, movement stripped down to its most basic components and most widely practiced forms. BodyCartography Project’s exploration of engagement is strongly grounded in Body-Mind Centering (BMC). In my brief experiences with that form, I’ve been skeptical of its dated (to my ear) language, and its focus on developmental movement patterns hasn’t stimulated me physically or intellectually. But in this work, I see a timely and relational application of BMC study. At a moment when the term “engagement” is used frequently and superficially, BodyCartography Project is deploying knowledge of organs and the systems of the body, along with kinesthetic awareness to create something grounded, complicated, and adaptive. They’re using real dance skills of sensing, paying attention, and examining perspective to redefine engagement. What’s more, these are tools that all humans possess—BMC just trains bodies to recognize and access them. closer (part 2) structures that pedagogical bent and shares immediate, practical, and embodied tools for practicing human engagement. 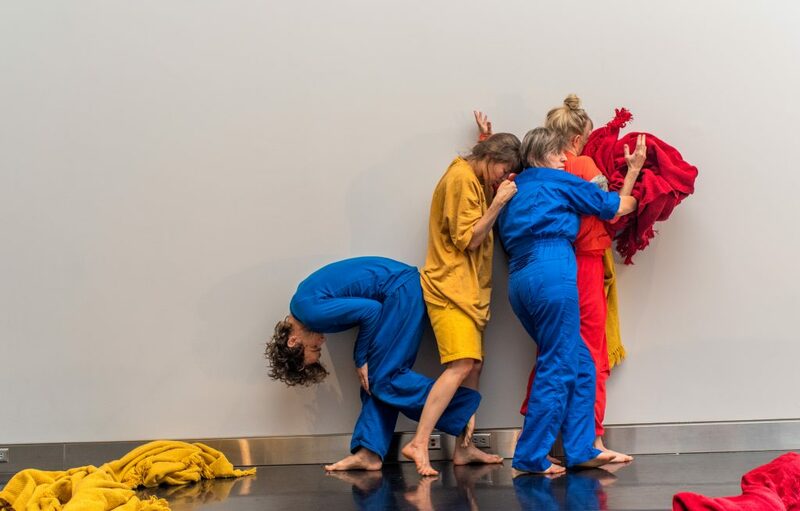 While the work is not overtly critical of engagement culture, BodyCartography’s genuine practice of attention and connection defines its own territory. BodyCartography Project’s closer (part 2) was staged at the Red Eye Theater in Minneapolis August 13 – 16. Read an essay on closer (part 1) on Mn Artists here: http://www.mnartists.org/article/private-dance-public-space. Find more information on the company online: https://bodycartography.org/.